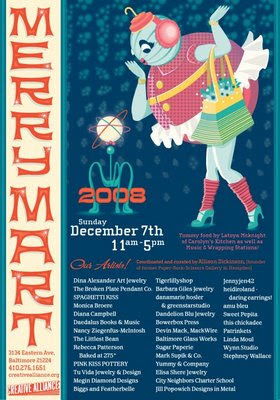 Jenny Jen42: Merry Mart This Sunday! ok..ok...ok .. i know..i know...i've been posting about more and more craft shows that I am in...good news that is.. I applied to all of these shows not thinking I would get in! Boy how things change in just one year! Here is yet another great show for your shopping pleasure. The Creative Alliance is a great place for holiday shopping with its holiday cheer and cash bar! Lots of awesome crafters..including many BEST members. So stop in this Sunday in Highlandtown hon! Dina Alexander Art Jewelry, The Broken Plate Pendant Co., SPAGHETTI KISS, Daedalus Books & Music, Sweet Pepita, Megin Diamond Designs, this chickadee, danamarie hosler & greenstarstudio, Dandelion Blu Jewelry, Bowerbox Press, Devin Mack, MackWire, Jennyjen42, Nancy Ziegenfus-McIntosh, The Littlest Bean, Linda Moul, Rebecca Patterson Baked at 275*, PINK KISS POTTERY, Jill Popowich Designs in Metal, Tu Vida Jewelry & Design, heidiroland - daring earrings!, Elisa Shere Jewelry, Baltimore Glass Works, City Neighbors Charter School , Sugar Paperie, Mark Supik & Co., Stephney Wallace, Yummy & Company. For more information, visit the Creative Alliance. See you there!